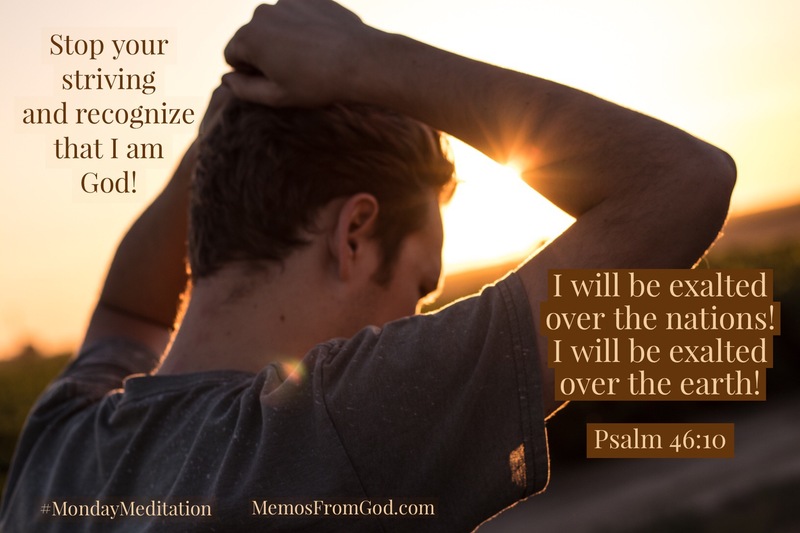 Format ImagePublished on February 4, 2019 February 25, 2019 Categories Assurance, God's Power, PeaceTags #MondayMeditation, encouragement, God's power, peace, PsalmsLeave a comment on Stop Striving! Want laughs, plus a way to tell a mother she's loved? Take her to see Moms' Night Out, opening Mother's Day weekend. When I visited this film's set last year, actors and producers promised it would be a hoot. They've delivered, with loads of family fun. I laughed out loud. Sarah Drew (Grey's Anatomy), Sean Astin (The Lord of the Rings trilogy; Rudy) and Patricia Heaton (Everybody Loves Raymond; ABC's comedy The Middle) highlight a cast portraying the chaos of parenting. Heaton and husband David Hunt executive-produced. Says Hunt, "None of us [parents] would survive a minute without a sense of humor…." "Because if you don't laugh, you will go crazy!" Heaton adds. "And then the kids know they're winning." Allyson (Drew) has her dream life – three adorable kids and a terrific husband, Sean (Astin) – but she's not happy. Her own lofty self-expectations are shredding her. Sean comes home one evening to find the house a mess and Allyson sitting on the closet floor watching her DVD player and eating, semi-catatonic from the day's stresses. She needs a night out with her girlfriends. Everything goes wrong. Allyson unplugs…and explodes, triggering a wild night. A trendy restaurant ejects the mommy friends, who desperately search for a missing baby at a tattoo parlor, embark on a "don't-try-this-at-home" car chase, and more. Country singer Trace Adkins plays Bones, a tattoo artist with a checkered past who leads a biker gang that joins the baby search with volunteers from First Baptist Church, led by Sondra's (Heaton) pastor spouse, Ray (Alex Kendrick, Courageous, Facing the Giants). Can you spell i-n-C-O-N-g-r-u-i-t-y? Twists and goofs galore keep you laughing while characters drop morsels of family wisdom down your wide open mouth. Sondra advises Allyson on parenting's craziness: "Life is…about finding the meaning and the joy and the purpose in…all the chaos and the crazy. It's knowing that God is with you on the good days and the bad days. Does my faith give me that? Yes it does. Am I always happy? No, that's a fantasy." In his Mother's Day sermon, Ray cites a biblical Psalm: "'Children are a blessing from the Lord.' That's why the position of mother is a high calling, and one that should be honored and protected." Even Bones contributes some pearls, remembered from his mother who throughout his youth reassured him of divine love. "I doubt the good Lord made a mistake giving your kiddos the mama he did," Bones assures the despondent perfectionist Allyson. "So you just be you. He'll take care of the rest." There's much more to make you laugh and think. Watch for Sondra's secret; cops' consternation; Marco's (Robert Amaya, "Snake King" from Courageous) obsessive/compulsive fears; and Sean citing a famous poem. On set last year, Heaton promised "Every woman in America is going to wish that she was married to Sean Astin," warning men in the assembled press corps, "You're screwed!" After a year holding my breath – and now that she's seen the film – I’m happy to report that my lovely wife Meg is still glad she married me, though she appreciates Sean's wisdom and example. A tip: don't skip the credits at the end, or you'll miss more fun. Moms' Night Out is a Kevin Downes production of an Erwin Brothers film, shot on location in Birmingham, Alabama, and distributed by Sony Pictures/TriStar. Rated PG (USA) "for mild thematic elements and some action"
I think this movie looks like fun even for those who aren't moms. Here's the trailer. Why sheep? Why not cheetahs or wolves or ligers or another animal with a bit of flair, a bit of class? But the Bible tells us often that we are sheep. We are sheep and God is a shepherd. That sheep/shepherd word picture is at the heart of the best-loved Psalm—Psalm 23. I spent some time with that psalm lately and tried to gain a better appreciation of why God saw fit to tell us we are sheep. I will admit I am not the world’s foremost expert on sheep. I grew up in the city and even now live in an area of town that explicitly forbids owning livestock. In place of first-hand knowledge, I spent some time reading about sheep. It was funny. And kind of humbling. Do a little bit of reading about sheep and you’ll soon see they are not survivors. They are not strong and independent creatures, not proud hunters or fierce predators. They’re actually kind of pathetic, entirely dependent upon a shepherd for at least three reasons. Two of these reasons are related to the brain of a sheep and the other is related to its body. This is a real news story that aptly tells us the first reason sheep need a shepherd: because sheep are dumb. Hundreds of sheep followed their leader off a cliff in eastern Turkey, plunging to their deaths this week while shepherds looked on in dismay. Four hundred sheep fell 15 metres to their deaths in a ravine in Van province near Iran but broke the fall of another 1,100 animals who survived. Shepherds from a nearby village neglected the flock while eating breakfast, leaving the sheep to roam free. The loss to local farmers was estimated at $74,000. One sheep wandered off a cliff and 1,499 others just followed along. Can you picture it? 1,500 sheep, each walking off a cliff, one after the other. Soon they were piled so deep that the ones at the bottom were crushed to death and the ones on top were lying on a big downy-soft pillow. It is completely absurd and tells us one important fact about sheep and the first reason sheep absolutely need a shepherd: they are not the smartest animals in the world. In fact, they may well be just about the dumbest animals in the world. And here’s a second reason sheep need a shepherd: they are directionless. Sheep are prone to wander. Even if you put them in an absolutely perfect environment with everything they need (things like green pastures and still waters), sooner or later they will just wander off. If a shepherd doesn’t manage them, if he doesn’t micromanage them and keep them under constant surveillance, they’ll wander off and be lost. Sheep are dumb and directionless. They are also defenseless. Left to themselves, sheep will not and cannot last very long. Just about any other domesticated animal can be returned to the wild and will stand a fighting chance of survival. But not sheep. Put a sheep in the wild and you’ve just given nature a snack. Think about it: there are different ways animals react when they perceive some kind of danger. Here are three common ones: fight, flight, and posture. Let’s think about fight. A sheep gets frightened or sees that he is in danger. Maybe he sees a bear rambling toward him. What is he going to do? He doesn’t have claws, he doesn’t have fangs, he doesn’t have venom, he doesn’t have spines or quills or large talons. He’s got nothing to protect himself. Fighting is definitely out. But that’s okay—there are lots of other animals that don’t fight it out. How about flight, just turning tail and running away? That’s a good defense mechanism. Unfortunately sheep aren’t fast; they certainly aren’t agile, especially when their wool is long, and even more so when their wool is long and wet. Last I checked they don’t have wings. A sheep is not going to outrun or outfly a bear. The sheep will not fight and it cannot take flight. So far it is looking pretty good for the bear. How about posture? A dog will bark and growl and show his teeth to warn you away. A lion will roar. A rattlesnake will shake his rattle. A cat will arch his back and hiss. The best a sheep can do is baaa. I don’t think that bear is going be too intimidated. It is for good reason that no one relies on a guard sheep to keep their property secure. Sheep can’t fight, they can’t run away, and they can’t scare away. So what does a sheep do when danger comes? It flocks. When a bear approaches, the sheep will gather with others in a pack and run in circles in complete panic, just hoping that the bear will choose someone else. Without a shepherd to protect them, they’ll be picked off and eaten one by one. Sheep are dumb and directionless and defenseless. So I guess when God says that we are sheep who need a shepherd, he doesn’t mean it as a compliment to us. It is just a very realistic assessment of who we are and what we need. We are sheep who are completely dependent upon a shepherd. To say that God is our shepherd and we are sheep, is to humble ourselves, admitting what is true about us, and to elevate God, declaring what is true of him. When you say, “The Lord is my shepherd,” you are saying something that ought to move your heart in praise and gratitude. To declare that God if your shepherd is to praise and glorify him because God the shepherd stoops down to care for poor, lost, not-so-smart sheep like you and me. Psalm 32:7 Does God’s Love Make You Want To Give? Author LCPublished on August 7, 2013 Leave a comment on Psalm 32:7 Does God’s Love Make You Want To Give? Published on August 7, 2013 Categories GivingTags giving, hiding place, Psalms, Rusty Wright, secretsLeave a comment on Psalm 32:7 Does God’s Love Make You Want To Give? It’s an old expression that I used to hear quite frequently when I was younger: “The sky’s the limit.” In other words, you can do anything; there is no limit. From our perspective standing on the Earth, the sky seems to be a very long way up, and it seems to go on forever. But Colonel Chris Hadfield has a different perspective. Chris Hadfield knows what it is like not to limit himself. He decided when he was 9 that he would like to become an astronaut, and since then he has chosen activities and school programs that would help get him there. Now, people all around the world have heard of Colonel Chris Hadfield, many hearing about him for the first time as the astronaut who tweets from space. As a Canadian who has lived in Southwestern Ontario, I have been hearing about him for much longer. He was the first Canadian to walk in space, and the first Canadian to operate the Canadarm. Today, March 13, 2013, Chris Hadfield becomes the first Canadian to command the International Space Station. Scientists who have studied the universe, and astronauts like Chris Hadfield who have explored it, know that there is so much more to it than we have yet discovered or than we can comprehend. But we do have enough information already to know that it could not have been created by human hands. Lord Kelvin observed that “if you think strongly enough, you will be forced by science to believe in God.” But even the psalmist David could see that. In Psalm 19:1-2, he said that the heavens declare the glory of God and reveal His greatness. The heavens declare in a language that we all speak. Even the best communicators can't do that. Commander Hadfield speaks several different languages, and he is a natural teacher. He imparts scientific and technical information in a way that is easy to understand, but he does not communicate in all the languages of the world. The heavens themselves declare the glory of God in a way that anyone can understand if they will just open their eyes to see. Day after day, and night after night we can see the vastness of the sky: the sun, the moon, the stars the clouds, thunderstorms and snow. So many different elements can be seen by the human eye and even more with powerful telescopes, but even from the perspective of the International Space Station we can see only a small fraction of what God has created. The next time you doubt that God is all-powerful, look up. *The title of this post comes from a documentary about Chris Hadfield that is available for purchase at the Crossroads estore. You can follow Commander Hadfield on Twitter, Facebook, and Tumblr. Your need for coffee aside, which would you do? Are you more likely to check your phone for messages from friends, colleagues, clients and possibly strangers? Or do you take a few minutes to go to God first? A healthy relationship requires regular and honest communication; without it, the relationship suffers. We spend our time on the relationships that mean the most to us. David, the psalmist, didn’t have the benefit (distraction?) of a smartphone, so perhaps his choice was easier: he went to God first. David made a habit of going to God regularly, not just when he wanted to extend a desperate plea for help. And although he often asked for help and protection from his enemies, he also praised God for His goodness and faithfulness. The pattern of his psalms often goes from complaint to praise. Psalm 5 is one of David’s morning prayers. In this Psalm, he starts by asking God to hear and consider his prayer. He doesn’t tell God what to do, but presents his case and waits expectantly for God to answer. (Psalm 5:3) We can see that David is confident that God will not only hear his prayer, but also answer it according to His character. David knows that God is a God of love and mercy, but He is also a God of justice, and David appeals to God to protect him from his enemies. (Psalm 5:4-6, Psalm 5:10) David asks for God’s guidance through whatever obstacles he must face, (Psalm 5:8) and he also asks for God’s blessing. (Psalm 5:11-12) Even though David is asking for God’s favour toward him, so that his life will be safer and better, David approaches God with reverence and praise—honest, but respectful communication. When you get up tomorrow morning, who will you go to first? How do you suppose your choice will affect the remainder of your day? We might not find ourselves in the same situation as the Psalmist does here, but we have certainly felt the same emotions. We may be saddened by our circumstances, lonely, irritated by malicious co-workers or neighbours, or burdened by the number of things we have to do. The good news is that we don’t have to get to the temple to be close to God. Because of Jesus’ sacrifice on the cross, and because of the Holy Spirit, we can communicate with God wherever we are. A look through God’s Word assures us that we have not been forsaken. (Psalm 37:28, Romans 8:38-39, John 3:16) Whatever you are going through, don’t give up hope. Wait on God’s saving intervention. You may have noticed that things don’t always turn out the way you hope they will. And they almost always take longer than you want them to. In this world of instant everything, many of us have lost our ability to wait patiently. And yet, there are times when we must wait, whether we like it or not. As I told you last week, I have been ill recently, and because of a condition that may or may not be related, and that did not resolve itself within six weeks, my doctor sent me for a medical test. I waited a month for that appointment, and the results were inconclusive. So I was sent for a different medical test. Again inconclusive. A third test has been scheduled for next Tuesday. It has now been almost three months without answers, and frankly without any information about what the problem might be. I am still waiting. Now if I were to be honest, I would have to admit that I don’t always have the best of attitudes in situations like this. I worry, and I often complain. Unfortunately, that only proves that I’m not as good as I would like to be at trusting God with the outcome. What should I do instead? As hard as it is sometimes, I should be praising God. King David had a lot of trials and struggles in his life too, so much more serious than mine, and he concluded that he should praise God continually. Early in Psalm 86, David was pleading with God for mercy, but in Psalm 86:12 he declared that he would give God praise with his whole heart and would honour His name continually. With his whole heart meant that David would be sincere in his praise; he wouldn’t just go through the motions. He could do that, because he had established a relationship with God, and knew that He was trustworthy. God had shown David His mercy many times before. David knew that he could trust God with his life and with the outcome to the situations he found himself in. Continually is pretty self-explanatory. At all times. In every situation. Since not all situations are good ones, David would honour God even when things weren’t going the way he wanted them to. Moira Brown has said that, “Praise is the elevator that lifts us out of the pit of despair.” If we can praise God even in the tough times, we will be able to focus more on the goodness and faithfulness of God, the One who is the same yesterday, today and forever, (Hebrews 13:8) rather than dwelling on the challenges in our circumstances. I’m still working on it. How about you?